This post was featured in an online magazine called Clapway. If you wish to help me make a little extra money by clicking this link and reading the article on their site, I would really appreciate it! If not, you can read it here. I arrive in Sarajevo bleary-eyed and slightly sore after a sleepless overnight ride over twisting mountain roads from neighboring Montenegro. The sun is just beginning to rise and a faint blue glow creeps westward across the still-black sky. It is bitterly cold and each breath I take burns my lungs; my exhalations are frozen puffs of vapor. I hand a scrap of paper with my hostel address to a burly cab driver. He glances at it and nods. I’m not in a position to negotiate, so I give him the money and climb in. Six hours later, I wake up to pale gray light flooding my room. I walk to the window and look outside: snow is falling heavily, covering the already laden ground with a fresh coat of powder. I grab my jacket, slip on my gloves, and walk out into the cold. 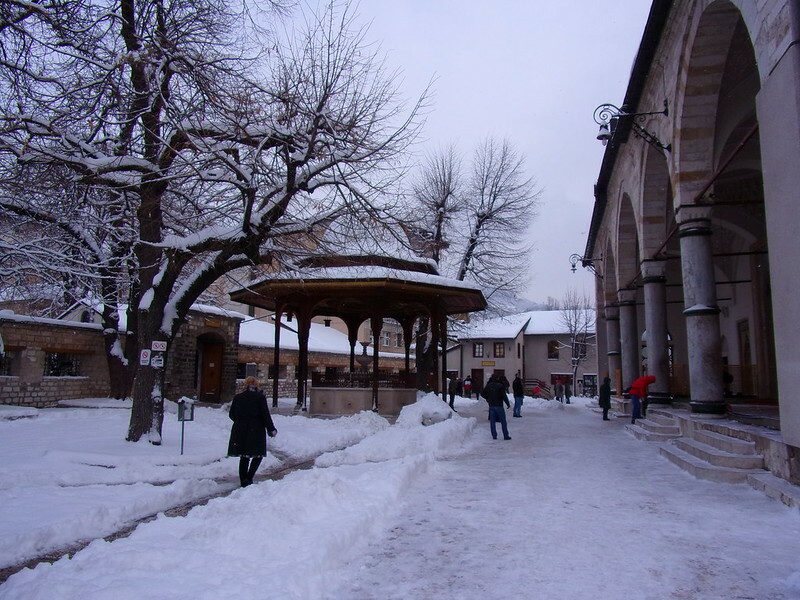 I am staying in Sarajevo’s old town, and a vision of wooden Ottoman rooftops and stony streets carpeted with snow greets my eyes. 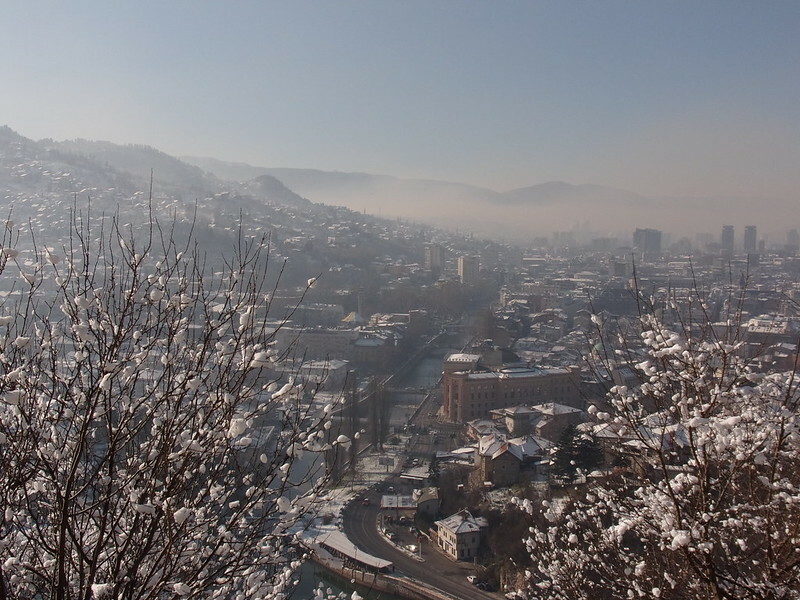 Old Sarajevo is a place defined by smoke; it’s an inescapable part of the urban landscape. There is the heady smoke of dry pine logs in iron stoves to heat the wooden houses built in close proximity, hugging each other to keep warm against the wet, windy air. 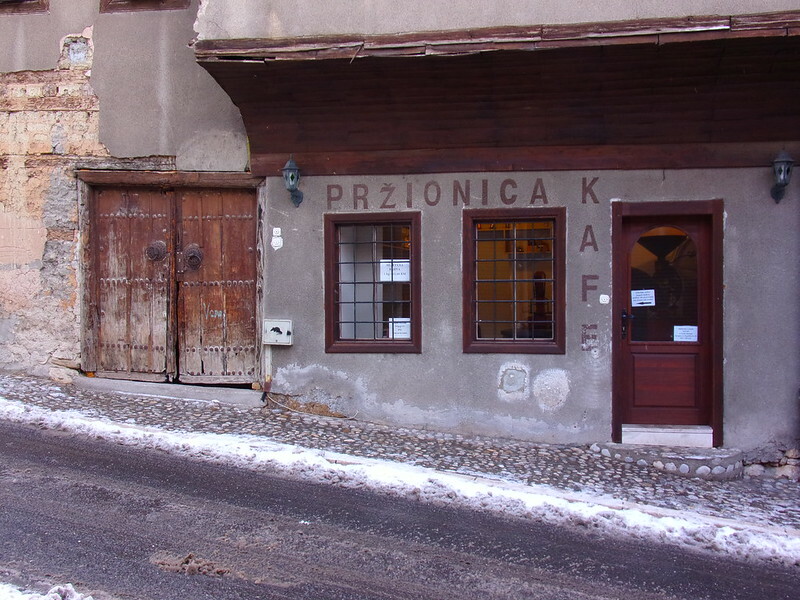 There is the raspy gray haze of cigarette smoke that stings the eyes and lungs every time you enter a café, where men in tracksuits and leather jackets drink black coffee and puff endlessly in the pursuit of čef—a Balkan term which basically means doing nothing. There is the nutty scent of smoke from charcoal braziers on street corners where vendors roast chestnuts on shallow metal pans with holes in them, their gloved hands waving small fans to feed the embers oxygen. There is the dense, fatty smoke from the grill houses where ćevapi are cooked to order over trays of smoldering charcoal. The faintly sweet smell of raw onions very subtly permeates the meaty scent as it flirts with the nostrils. There is the acrid, thick black smoke of garbage being burned inside metal dumpsters. Usually incineration is a DIY affair, and an older man pours glistening lighter fluid into one before tossing a match in. Some sections of the street are snowless—just puddles of brown slush with bootprints tracking through them. 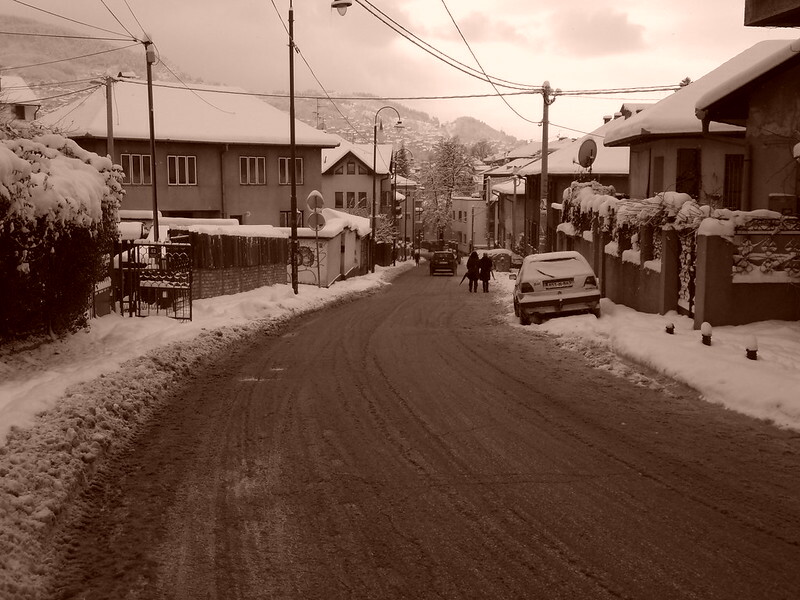 I plod uphill out of Old Sarajevo and walk up a quiet residential street. My shoes crunch on rock salt and fragments of ice that cling to the wet asphalt. A bushy-tailed ginger cat darts out from beneath a parked car in front of me and dives down a ravine, chasing something my eyes can’t see. After the branches stop rustling, there is a moment where everything is still; then comes the tolling of church bells, ringing noon. 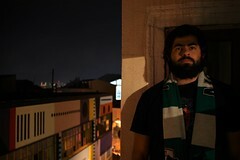 They echo across the valley, and just as they finish the cry of the muezzin begins. “Allaaaaaaaaaah, huakbar,” repeated over and over again, from one minaret to another, the Arabic words drifting upwards past the falling snow. My feet are damp and have carried me to the top of the hill, the snow has stopped falling, and the sun is just starting to peek out from behind the clouds. A group of young boys comes trudging up the hill, carrying a sled behind them, eager to take advantage of their lunchtime break. 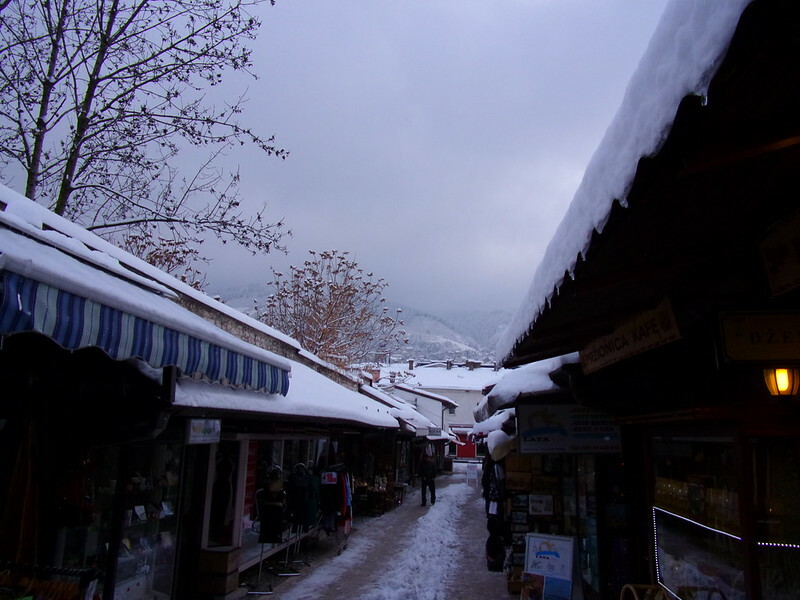 I hear their laughter as I walk back down into Old Sarajevo, their shouts of delight slowly melting into the cacophony of passing cars, gossiping ladies doing their midday shopping and vendors hawking turnips and roasted chestnuts by the side of the road. 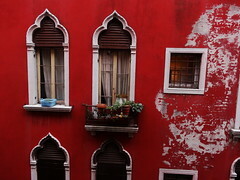 Posted in UncategorizedTagged Bosnia, Sarajevo, travel, walking, winterBookmark the permalink. Love these photos. You can feel the weather. The shot of the Cafe is super. Thank you! It was chilly!